Italian fashion designer known for understated elegance. 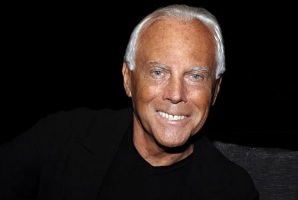 Armani attended medical school for a couple years, then started in fashion as a window dresser in an Italian department store. He later worked for Italian designer Nino Cerruti. In 1974 he debuted his first menswear collection; today, he owns a fashion empire than has done very well indeed: in 2004, he was ranked 294 in Forbes list of the wealthiest people in the world. Lines include Giorgio Armani Borgonuovo (luxe), Armani Privé (couture), Le Collezione (diffusion line), Emporio Armani (upscale sportswear) and A/X Armani Exchange (denim & sportswear). Fragrances are produced under licensing arrangments with L'Oreal. Armani's first big fragrance success came with 1995's Acqua di Gio for women, followed by Acqua di Gio for men in 1996. Other fragrances include Armani Pour Femme (1982), Armani Pour Homme (1984), Gio (1992), Emporio Armani (1998), Armani Mania for women (2000), Emporio Armani White (2001), Sensi (2002), Emporio Armani Night (2003), Armani Mania Men (2002), Armani Mania Women (2004, new version), and Black Code (now renamed Armani Code) for men (2004). Also see review for Emporio Armani City Glam for him (2005). The Armani Privé line is sold in the US at Barneys, Saks, Giorgio Armani boutiques or online direct from Armani (see link below). The Armani line can be found at major department stores or online fragrance discounters. See all articles on Now Smell This tagged Giorgio Armani, or see our collection of Armani fragrance commercials.